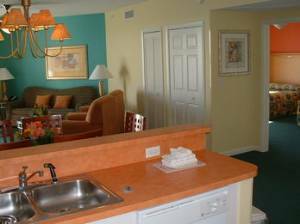 The oceanfront, Art Deco-style Wyndham Ocean Walk is located in a traffic-free beach area, a quarter-mile from Adventure Landing, and approximately 10 miles from Daytona Beach Airport. This location is also half a mile from Main Street Pier, five miles from Volusia Mall and Daytona International Speedway, 12 miles from Ponce de Leon Inlet Lighthouse, and 45 miles from Saint Augustine and the Kennedy Space Center. Hotel amenities include the 300-foot lazy river that surrounds a putting green and overlooks one mile of traffic-free beach. The hotel houses a lounge, dining room, convenience store, game room, fitness room, and golf-training center. This property offers gated, landscaped beach access, Internet access, free parking, two outdoor and two indoor swimming pools, hot tub, children's activities, laundry services, and restaurant. One- and two-bedroom condos are available. The one-bedroom/one-bath unit is 865 square feet and is equipped with one king bed and a queen sleeper sofa (max four guest). 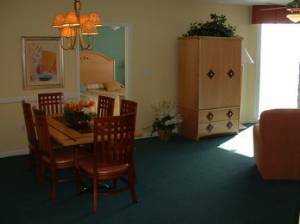 The two-bedroom/two-bath unit is 1347 square feet and is equipped with one king bed, two double beds, and a queen sleeper sofa (max six guests). 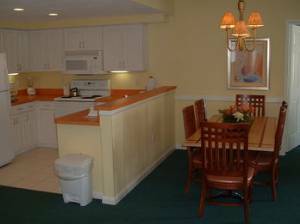 All rooms feature kitchens (with refrigerators, microwaves, and dishwashers), washers and dryers, ceiling fans, air-conditioning, irons and ironing boards, DVD/VCR players, CD players, dishes and utensils, hairdryers, balconies, and cable TV. Jacuzzis units are available. Cribs are available upon request. At the heart of Daytona Beach’s most famous shoreline, Ocean Walk Shoppes & Movies is a collection of upscale eateries, boutiques and 10-screen movie theater will captivate guests with afternoon and evening delights. 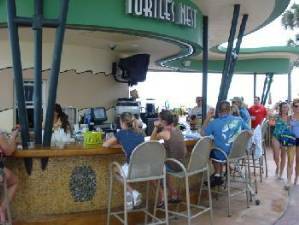 A live web cam at www oceanwalkshoppes com allows guests to view the Ocean Walk Shoppes, Bandshell and the Atlantic Ocean. Crashing waves and famous sunrises. Tropical drinks on oceanfront decks. Surf shops and sophisticated nightspots. If these attributes sound alluring, DAYTONA BEACH is likely the place for you. Ocean Walk Daytona Beach has an energy all its own. There's loads to do here, both during the day and at night. The hard-packed sand makes for fun shoreline bike rides or strolls alomg the beach. Barreling waves make the area a surfers paradise. But that's not to say you can't relax here. Sunbath on a chaise lounge. Soak in a Jacuzzi under the stars. Or park yourself at a shaded table at a waterfront restaurant and enjoy fresh-caught seafood. This place, with its history of grand hotels, car racing and speed, was once a playground for the wealthy. It's now also a mecca for families, who return year after year for the mix of family-friendly accommodations and activities. 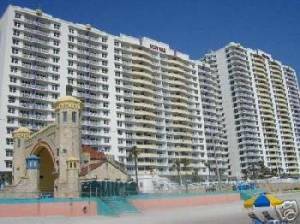 Like Daytona Beach, the Ocean Walk Resort is located in the heart of all the action and caters to both families, couples and visitors young and old. A muliti-story building with a wide, expansive beach, the Ocean Walk Resort is a true beach resort, where guests can lounge on a poolside chaise and gaze out at the ocean through a frame of palm trees. The resort has a stylish Art Deco design that runs throughout, from the ice blue and sea green Landing Bar lounge to the two indoor pools. 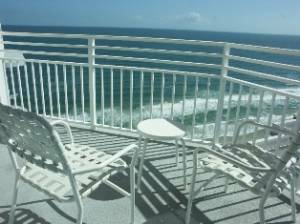 WE ALSO HAVE SEVERAL ONE BEDROOM OCEAN CONDOS AVAILABLE AT THE DAYTONA BEACH OCEAN WALK RESORT! CALL CINDY FOR AVAILABILITY AND LAST MINUTE SPECIALS. THIS TIME STAY @ A NICE PLACE. Thank you so much for the rental of you wonderful facility. It was absolutely perfect for us! 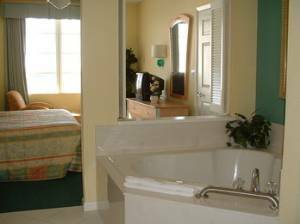 I would like to reserve the same unit for next year for MLK weekend the Fri-Monday. Deposit: $300 security deposit required.. This is returned to you after cleaning and inspection of unit as per no damage.